Lord Ganesha is one of the most loved and revered Hindu God. The elephant-head Hindu deity is popularly called Vighanharta, the remover of obstacle; hence, his believers evoke him and seek his blessings before the commencement of any task. Interestingly, he is also called as Vighankarta, the creator of obstacles. He is the amicable and benevolent Lord who rides a mouse and eats modak, a sweet made from rice flour, jaggery and dry fruits. If you will ask any Ganesha devout, you will come to know that different parts of Lord Ganesha’s body have symbolic meaning. While the large elephant head of the Lord signifies intelligence, wisdom and brain that one must have to tackle the difficulties of life, his large ears represent that one must be willing to listen. His big bespeaks that one should be attentive and observant; while his trunk signified the flexibility and proficiency that one should have to handle worldly issues. He has a huge belly that links to the stamina and energy that one should have to digest the good and bad things of the world. You must have noticed that in India, people love to adorn their homes and entryways with Ganesha paintings and sculptures. These artifacts are not only popular in India, but there is also a huge demand of these paintings and idols across the globe. 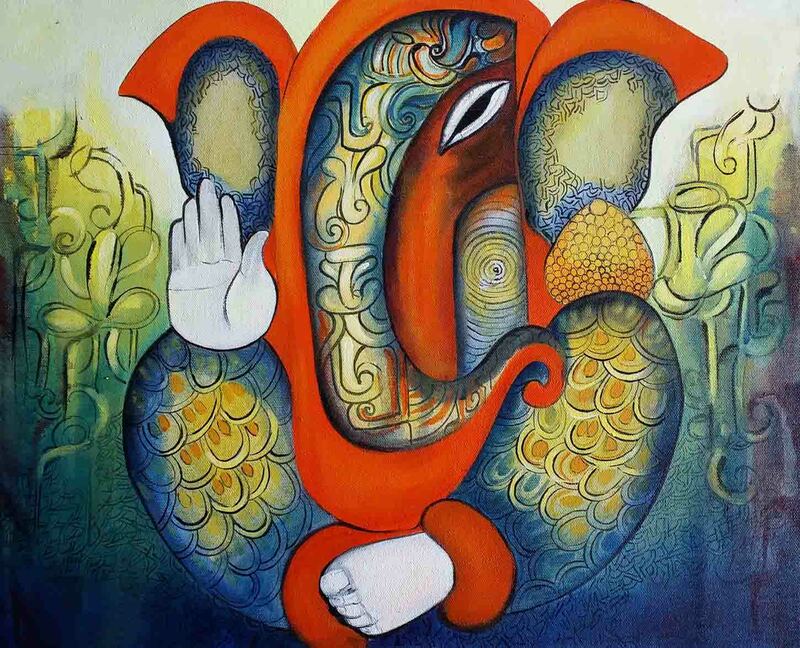 If you are a Ganesha devotee, then you must have observed that some of Ganesha paintings and sculptures have his trunk turned towards right, while others have his trunk turned towards left. Have you ever wondered what is the significance behind the placement of Lord’s trunk? Let’s discuss the meaning and significance of Ganesha’s trunk in this blog. Though, there are several explanations and believes regarding the direction of Ganesha’s trunk, almost all of them assert the same thing that the right trunked Ganesha paintings and idols are stronger, more powerful, dominating and difficult to worship. It is a common believe among the followers of LordGanesha that Ganesha idols that have his trunk turned to left side is calm because the left direction signifies the direction of moon channel. This channel provides energy to left sympathetic nervous system that part of brain that relates to one’s emotional life.On the other hand, the right trunked idols of the Lord are more powerfulbecause the trunk is turned towards the sun channel, which relates energeticflow. This channel supplies energy to the right sympathetic nervous system which is related to supra-conscious mind. Therefore, the idols and paintings of Lord Ganesha that has trunk turned towards right are considered to be aggressive and challenging. So, if you are planning to buy Ganesha paintingsor idols for you home, consider buying such artworks where the trunk of the Lord is turned towards left.